I used two of these in my pantry cabinet. They organize canned goods so they are visible and easy to access. For bamboo tiered shelves, click below. 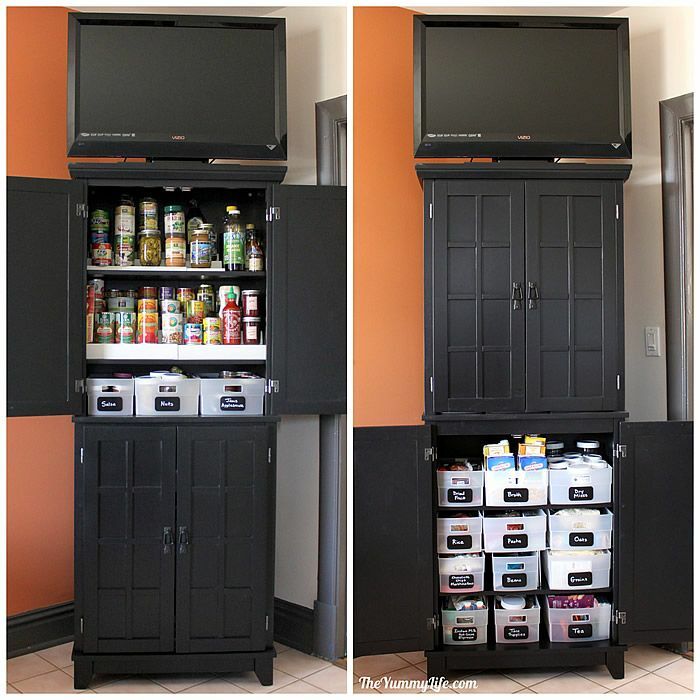 These can be used on taller shelves to double the amount of storage space, and make items easier to access. 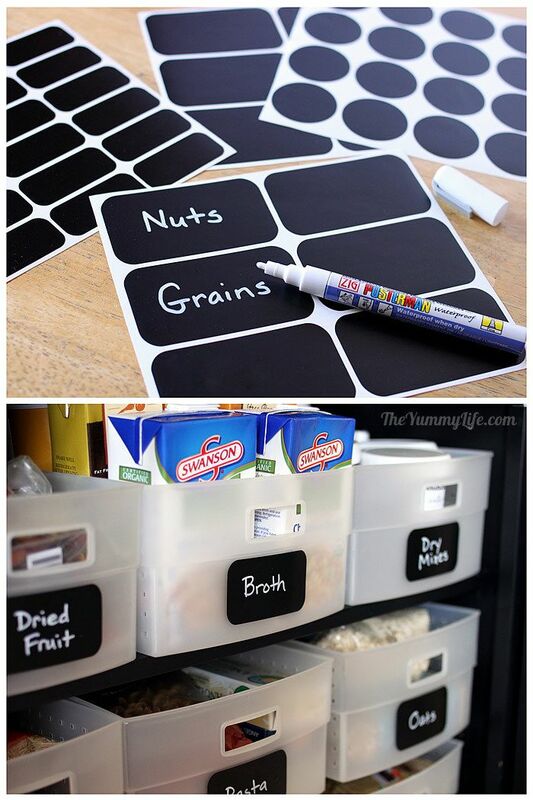 These are fun, easy to use, and the perfect size for labeling plastic bins in a pantry. The ink stays put, but can be removed with window cleaner. For more label and pen options, click below. This TV fits perfectly on top of my pantry cabinet. I like to watch the Food Network while I cook. (I'm weird that way.) We like these TV's so much, that we have 3 of them--great picture quality for the money. 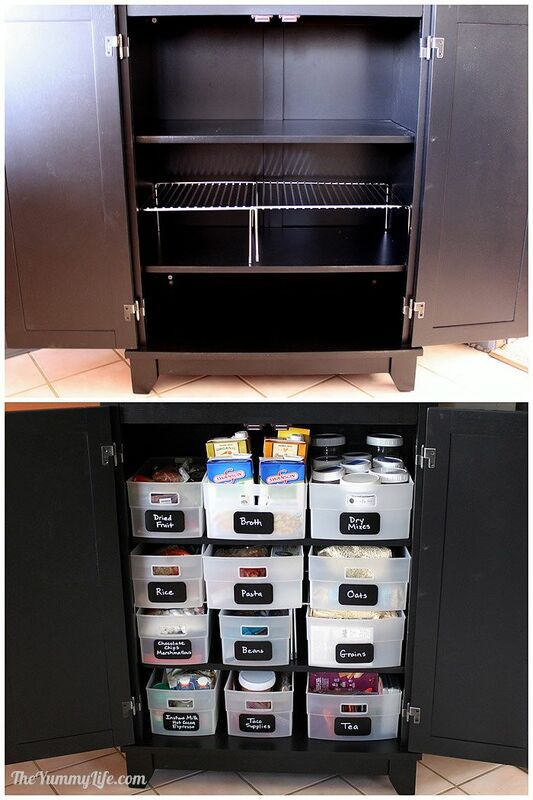 Get organized with this easy kitchen storage solution. "Necessity is the mother of invention." Yep. That certainly applies to how my new pantry cabinet came to be. Life happened. Life as I knew it suddenly took a left turn. As a result, I've done some major reorganization in my house, and this organized pantry cabinet is one of the happy outcomes. The back story. If you follow my blog and have noticed that lately I haven't been posting as often, this will explain why. I will get back on track with more frequent posts again, so hang in there with me. My life has been on the crazy train, but gradually getting back on track and finding a new normal. Earlier this year, we suddenly and unexpectedly determined that we needed to move my mom from her home of 40 years in Tucson to live with King-Man and me in St. Louis. For those who know my mom (aka Grammy) or have read about her in my previous posts (Grammy's Granola is among her greatest hits), rest assured that she is physically healthy. Her memory is fading, though, and she can no longer live alone. Given her lifelong devotion to healthy eating and living, this struggle with memory loss has been an unfair turn of events for her. But, she's a trooper and is now happily settled with us in her new home in St. Louis. Mom needed to be in our home where we could look after her, but she is still healthy and independent enough that we thought she'd be happiest with some privacy and space of her own. So, in a few short weeks, Jerry, a skilled & awesome carpenter/electrician/plumber (with a big dose of angel mixed in) transformed our mess of a basement into a lovely finished studio apartment for my mom. My sister, Nelda, contributed design and shopping assistance from California (thank you, internet), and together we created an awesome new home for our mom. We also had to pack up Mom's Tucson house--no small task after 40 years there. A mountain of her boxes traveled from Tucson to St. Louis. It's been a busy couple of months. Goodbye basement storage. King-Man and I have an old home, built in the 1930s, and that means it has limited closet and storage space. For the 15+ years that we've lived here, I've used our basement for overflow storage: food, dishes, canning supplies, holiday decorations, tools, craft supplies, luggage, props for my blog photography...you get the idea. If you don't live in an area where basements are common, you may not understand this; but most of us in the Midwest don't know how to live without a basement. It's the place to throw everything that doesn't fit in the living space upstairs. My "stuff" was arranged on shelves, neatly stacked thrown on the floor, and was pretty much a cluttered mess. Remodeling our basement into a living space for Mom meant that all of the stuff piled in our basement had to find a home in the upstairs living space. Everything. Yikes. It's been an overwhelming process; but, by golly, we've done it. It took getting creative with the space we had, but it's turned out that my house is leaner, better organized, and more efficient for everyday living that ever before. First, the kitchen. I started with a complete kitchen reorganization. I literally took everything out of my kitchen cabinets and started over. I reorganized the entire space to make room for everything and at the same time be a more efficient working space for me. It needed a major overhaul without the benefit of remodeling of any kind (no time for that). I had to work with what I had. I gave a lot of thought to what cooking gear and food I used most often, so I could arrange my kitchen so those items had the most convenient access. I'll be sharing a number of my kitchen organization redo's in upcoming posts. We've now settled into a new lifestyle with my mom under our roof. Our family is better for it, and an unexpected outcome is that our house is better for it, too. Day-to-day life is so much more manageable now that the clutter of stuff in my basement is neatly and efficiently organized upstairs. Here's my first post on my kitchen reorganization. Even without adding a new cabinet to your kitchen like I did, you may get some ideas for organizing your existing cabinets more efficiently. Or, if you have some kitchen pantry tips to share, please leave them in the comments section at the end of this post. Finding the right space. 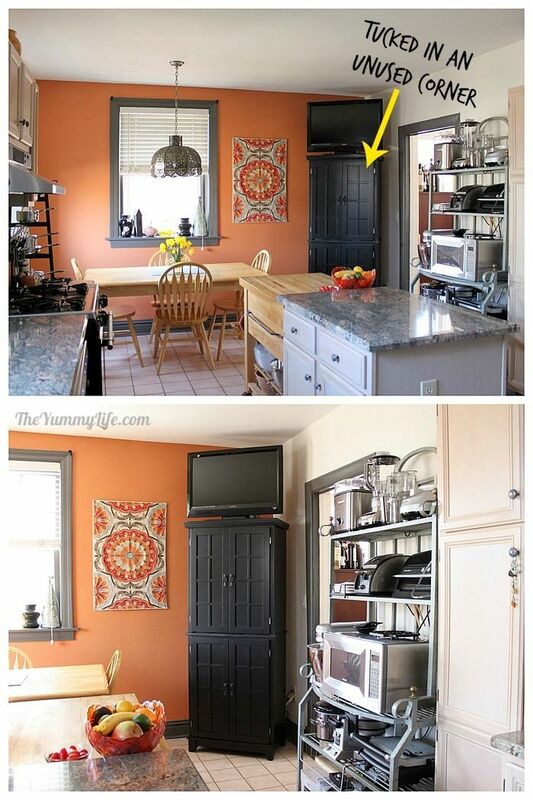 Almost all of the wall space in my kitchen was already lined with cabinets and shelves. But, there was one unused corner next to my kitchen table that was big enough to fit a free-standing cabinet. 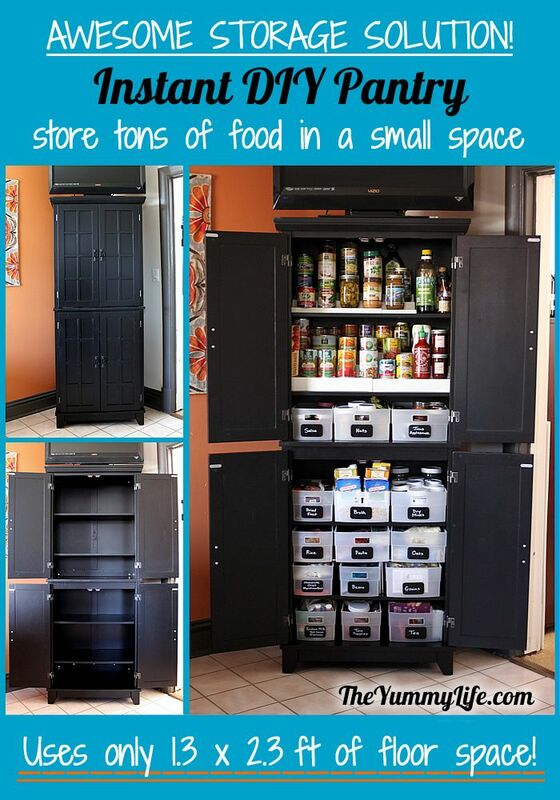 If you want to purchase a cabinet to make your own pantry similar to mine and you have limited space like me, look for something with a small footprint (the base of mine is just 1.3ft x 2.3ft) so you won't need much floor space. And, go tall--the taller the cabinet, the more shelves (and food) it will hold. I turned mine at an angle in the corner to conserve wall space next to the table, and because I like the way it looks that way. I ordered my cabinet from Wayfair.com. They have lots of options. Small but mighty. Even though this pantry cabinet is occupying a small amount of floor space in my kitchen, it holds a mighty big amount of food. Mine stores all of my canned and dry goods, except for spices and baking supplies. The cabinet itself is nothing more than shelves with doors. With a few added organizers, a pantry was born. It's a TV stand, too. Turns out that the top of the pantry cabinet was just the right size to hold my 32" flat screen TV. The angle and height are perfect for viewing while I cook. I spend a lot of time alone in the kitchen working on recipes and photos for the blog, and I like to watch the Food Network while I cook. It's background noise as much as anything, and I pick up the occasional cooking tip, too. Somehow I feel one with those celebrity chefs when I'm cooking alongside them--virtually, that is. view on Amazon: 32" Vizio HDTV. We have 3 of these; great picture quality for the money. 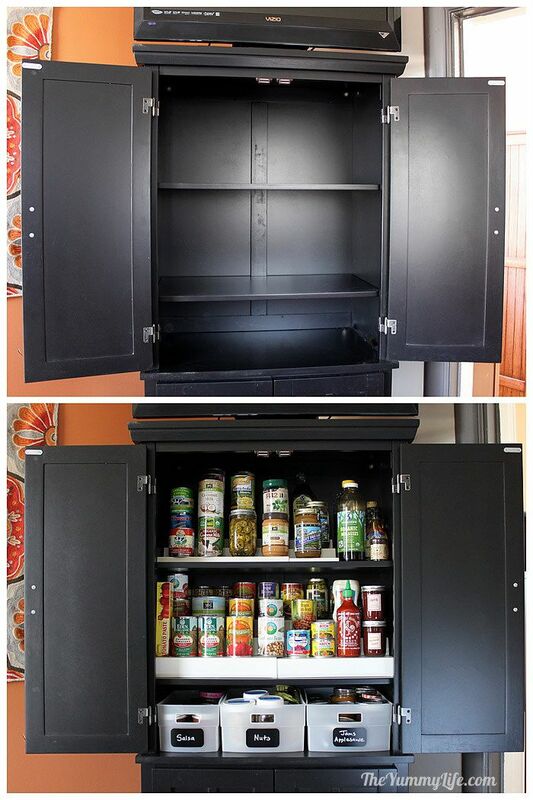 Top & bottom storage. I did a lot of looking around for a cabinet that was the right size and would look good in my kitchen. I settled on this one that has two sets of cabinet doors--top and bottom. 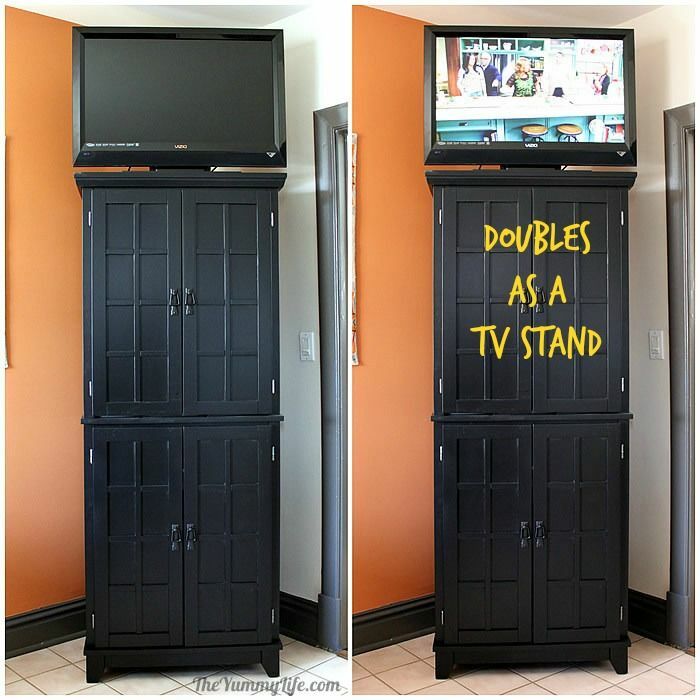 If you're shopping for a cabinet, try local furniture and home improvement stores. If you don't mind assembling your own, Wayfair.com has a good selection. That's where I bought mine. 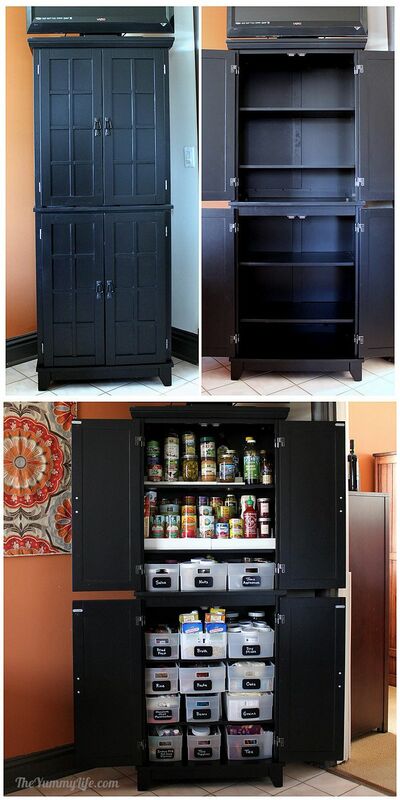 I ordered this black cabinet for the kitchen and purchased 2 in a honey oak color for additional storage in our bedrooms. They're sturdy and well made. Assembly takes awhile, but the instructions are clear. Top cabinet organization. It has 2 adjustable shelves, and a permanent base shelf. I put canned goods on the top two shelves, and plastic bins on the bottom base shelf. 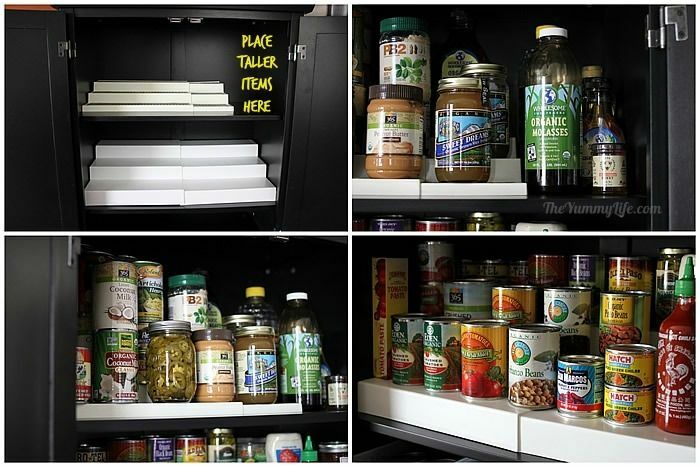 Expandable tiered shelves for canned goods. These make it easy to see and access canned goods. They expand to extend across the shelf. I used two of these on the top two shelves. The lower one extends across the entire shelf. I left some space at the end of the top one to allow a place for taller bottles. Plastic bins hold groups of similar items. On the base shelf of the top cabinet, I stored like items in 2 sizes of plastic bins that fit perfectly on the shelves. The bins are just the right depth and width to use up all of the space efficiently. Bins work well for categories of food where I stock a number of similar items. It is so much easier to slide out a basket to find the nuts or jar of jam that I'm looking for. In the past, they were all crammed on a shelf together, and I had to move around lots of jars, cans, bags, or boxes to find what I needed. This is way better. And, it looks prettier, too, don't you think? Bottom cabinet organization. Like the top cabinet, it has 2 movable shelves and a permanent base shelf. I used the entire base cabinet for more rows of plastic bins. Canned, bagged, and boxed dry goods are sorted by category and labeled. Additional wire shelves, doubled the number of plastic bins I could store on the middle shelf. Choose from expandable shelves that fit a variety of widths or a combination of shelves in different sizes. My favorite plastic bins. I use these for storage all over my house, and especially in the kitchen. Their depth and straight sides result in efficient use of shelf space. 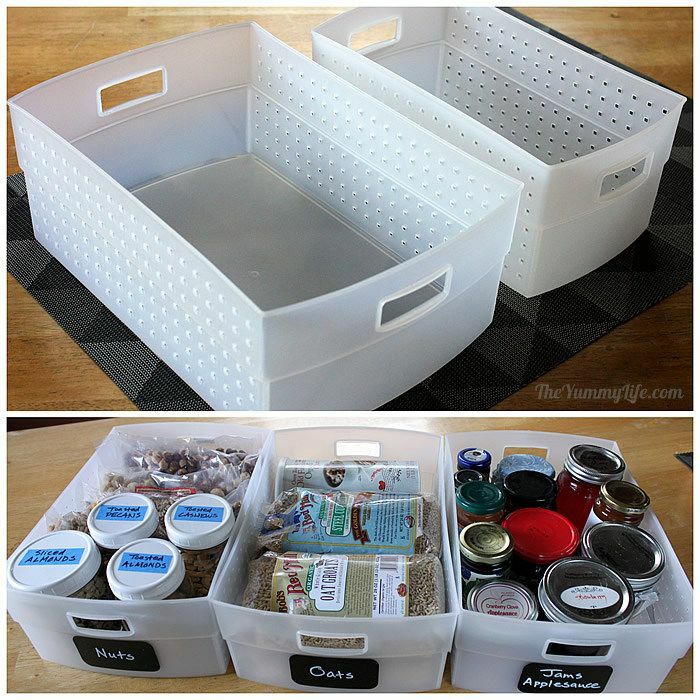 I bought my bins at The Container Store--they come in 2 sizes. Both of these fit well in my pantry cabinet; I used a combination of the two sizes for jars, cans, boxes, and bags of dry goods. 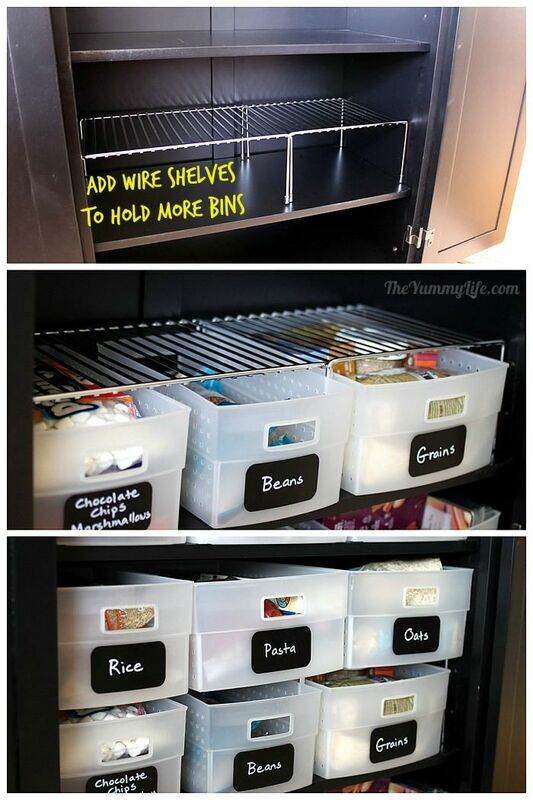 These bins are so easy to pull in and out of the pantry shelves. 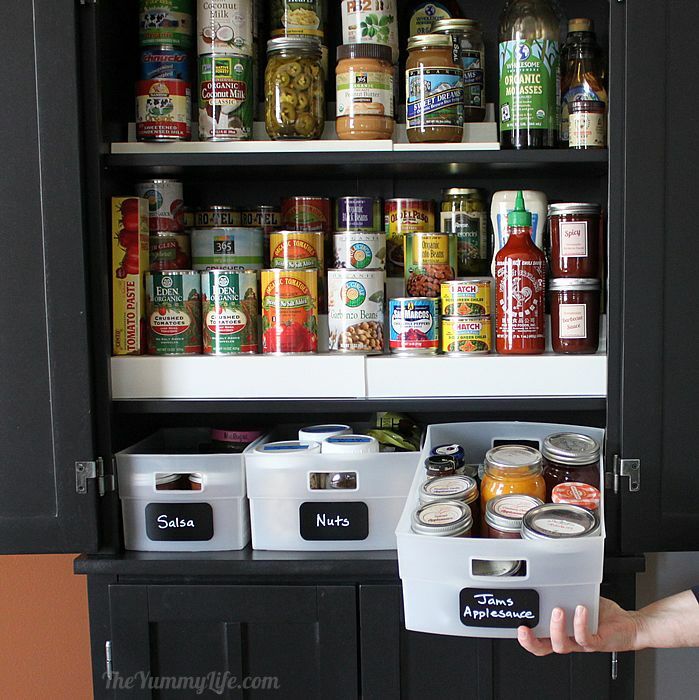 TIP 1: First sort your pantry cans, jars, boxes & bags by category. (I sorted mine on the kitchen table.) Then you'll know the size and quantity of bins you'll need for each category. If possible, leave some extra space in each bin for adding new items after a trip to the grocery store. 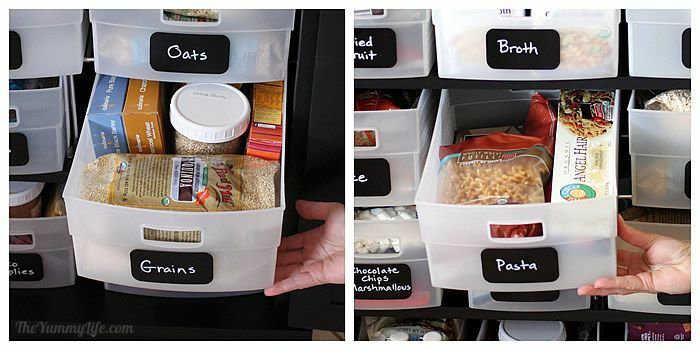 TIP 2: Put the bins of food items that you use the most on the upper pantry shelves where you have quick and easy access to them. TIP 3: Bags & boxes too tall for the bins & shelves can be put on their side. I put cans and jars upright, since they're shorter. Bags and boxes go on their side. You'll be amazed how much food will fit in these when you pack them efficiently. They are virtually permanent. By "virtually", I'm just saying that nothing lasts forever. But, these labels have amazing sticking power. I've tried other labels that won't adhere to these plastic totes, but the chalkboard labels stay put. You can wash the bins and get them wet, and they still stay put. Some of the Amazon reviews say they're dishwasher safe, but I haven't tested that personally. The chalk pens don't smudge or rub off like chalk, but unlike a permanent ink marker (like Sharpies) you can remove the chalk ink with a Windex-type glass cleaner that contains ammonia. So, you can change the contents of a plastic bin, wash off the chalk pen labeling, and re-label it. The writing stays put when you want it to, but it's changeable. Perfect! The labels come in lots of sizes and shapes. I use these for lots of labeling in my house now, like on the spice jars in my homemade garlic salt post. There's a size for everything I've needed. They look cool--don't you think? 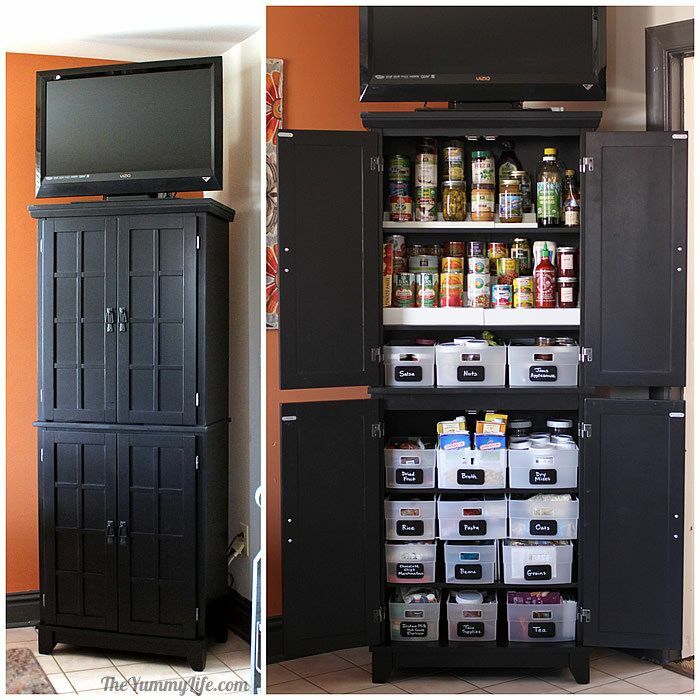 I like their homemade look, yet they have a coordinated, organized appeal that adds continuity to my pantry shelves. I used to dread putting away groceries when I got home from the grocery store. Before, I had to do all kinds of rearranging in my kitchen cabinets to make everything fit; and I almost always had an overflow that had to be stored in the basement (not exactly convenient when it was time to cook). Now, my pantry items are neatly organized and at my finger tips. For the first time in my life, I actually enjoy putting away groceries. It's fun with such a functional, organized, and attractive pantry cabinet. Opening my pantry doors makes me smile. Ahhhh. I'll be showing you some of my other kitchen reorganization results in future posts. So stay tuned. DISCLOSURE: This post has Amazon and Container Store affiliate links.